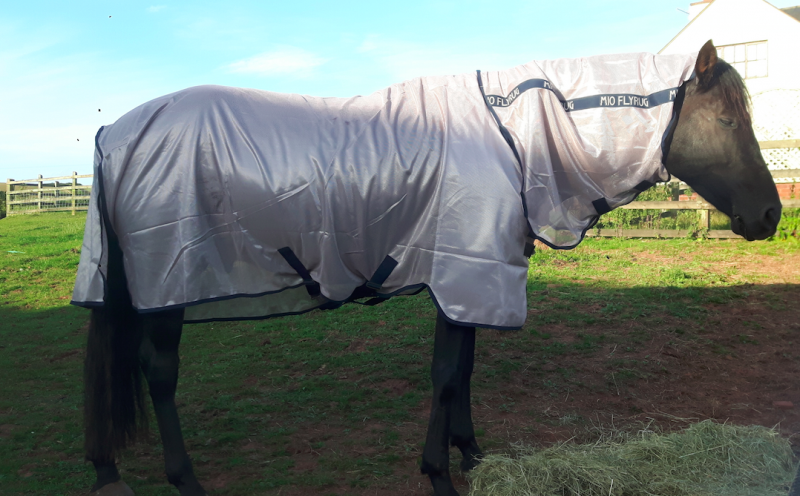 Just purchased: our 3rd fly rug of the season! Okay so I’m a little behind this year and granted this article would have been more use at the start of the season. But after a summer of caring for my itchy gelding I fancy myself as something of an expert. One horse. Three fly rugs in almost as many months. This will be a familiar tale to many whose horses make mincemeat of rugs boasting ‘tough outers’. Raymond does have an excuse. He’s been plagued by flies this Summer and the poor thing is suffering from sweetitch. I can only imagine how it must feel to be constantly itchy. We tried a shelf load of remedies. But the advice from the vet is to keep the flies off him in the first place. Sound advice. We’ll go into more detail on lotions and potions in another blog. For now it’s all about the rugs. Which, by the way, may negate the need for all the lotions and potions. Wow he really looked the part in this one for at least a week. Nice and shiny with a matching hood. At £135 it wasn’t cheap . On the one hand it was tough and did serve him well for a few months of hard rubbing and plenty of rolling. But the flies still got in and he was very sore. I should mention that Raymond was on a dairy farm at this point so there were a huge number of flies to contend with so perhaps an unfair review. But another issue I have is after a while the hood did start to drop. And the fly mask (which came free with mine as part of promo offer) does not attach to the hood leaving a gap at the top for the flies to do their work. Next up I went cheap and cheerful. £35 for a new rug. He had, literally, destroyed it within 24 hours. So now I have to buy another and get it delivered ‘next day’! Lesson learned. This rug is probably fine as a mild protective layer for inactive horses with no fly issues as such. Therefore. Useless. So now we’re onto our third and hopefully final rug of the year. 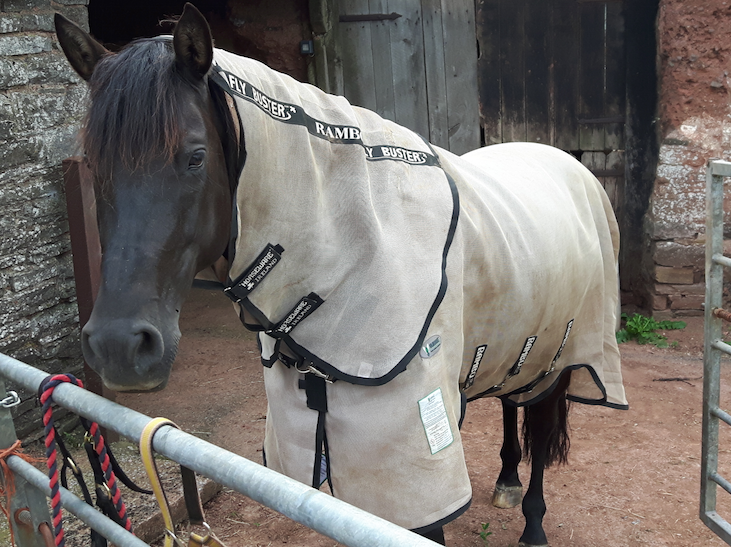 It’s a ‘sweetitch rug’ designed they say to keep even the smallest midges away. I choose it because it looks snug and secures well with the bit over the ears (why don’t they all do this? Hoods can not stay up on their own!). And it comes with a face mask too. It’s a little snug around the neck so we can’t do up the top strap. But that hasn’t caused any issues. And he’s quite a sight (pics to follow). Seems to be doing the job though – watch this space.